Today, Politico reported on Marco Rubio’s latest fundraising gimmick: asking donors to pay for his campaign travel while he spends time doing everything but the job Floridians elected him to do. Given the fact that Rubio boasts one of the worst attendance record in the Congress, Florida Democrats have decided to take him up on his offer. 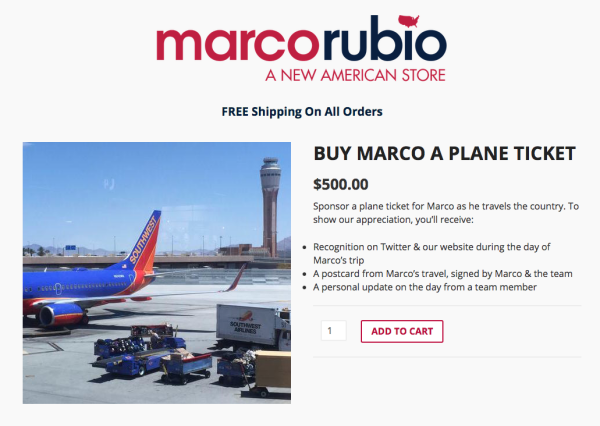 If Marco Rubio promises to attend all of his votes, committee meetings, and hearings in Congress this week, we will pay for his round trip flight from Florida to Washington, D.C.
“Instead of begging hardworking Americans who actually show up to their jobs to subsidize his campaign travel, Marco Rubio should make use of the $174,000 taxpayers are already paying him and show up to work,” said Florida Democratic Party spokesman Max Steele. “Clearly the shame of failing the people of Florida isn’t a compelling enough reason for Rubio to do his job, so we will sweeten the deal.